The other day I was wearing the springlike combination of Demeter Vetiver and Lavender. I'm not usually in the habit of mixing commercial scents, but Demeters lend themselves to this treatment because they're so single-mindedly one-note (in a good way, obviously); you hardly ever have to worry about elements of the scents clashing with one another. As it turned out, Vetiver overpowers Lavender by a considerable margin: equals amounts of the two produced hardly anything except a wall of vetiver, which is extremely nice but not what I had planned, so I had to up the dose of Lavender until it could stand its ground. 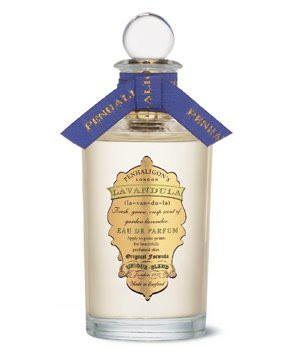 At any rate, when I was wearing my Demeter concoction the other day, I remembered that I had a sample of a Penhaligons scent, Lavandula, that I'd never even tried. The name, which is the Latin word for the plant, suggests it's positioned as a women's scent (it has some company, including Guerlain's Lavande Velours and Yardley's English Lavender), as does the company's website, and I was interested to see what they'd do to it to move it from the standard men's-toiletry category into the women's. Nothing, as it turns out. It's a men's lavender scent, and a very good one, too. It opens sharply, with a big sprig of lavender joined to a scrub-brush of cinnamon and pepper. The greenness that always seems to be a part of fresh lavender is there, too, along with a bright, almost lemony quality that together give the opening a cheerful zing. It's a real eye-opener. The scent soon calms down to a vast field of slightly soapy and rather camphory lavender (not as much camphor as the Demeter, but enough) underlaid with a hint of warmth, a ray of sunshine that slowly deepens into a creamy pool of musky vanilla and amber. The lovely thing about Lavandula is that it never lets you forget for even a second that you're smelling a lavender scent. From the very first breath to the final trace of it on your skin, it's lavender in a perfect crescendo-decrescendo. 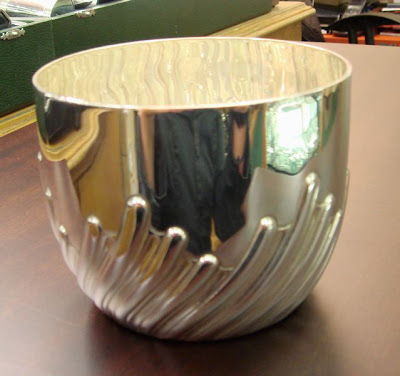 Our dear friend Trish just sent us a wedding present, a silver bowl, and wouldn't you like to see it? It's even more beautiful in person (so to speak--I mean, if you were here in person to see it). It was made in 1889! It's now officially the nicest thing we own. Yes, they're the newest Bond No. 9 Mother's Day offerings, in (respectively) Nuits de Noho, Chelsea Flowers, and The Scent of Peace (none of which I have written about yet, though I will). I should probably think the bottles are cheap and gaudy, but I don't. I think they're pretty. Maybe your mom would, too. Would she think you were throwing your money away at $500 a pop? But they're shiny! Now this is what science is all about. Astronomers searching for the building blocks of life in a giant dust cloud at the heart of the Milky Way have concluded that it tastes vaguely of raspberries. In the latest survey, astronomers sifted through thousands of signals from Sagittarius B2, a vast dust cloud at the centre of our galaxy. While they failed to find evidence for amino acids, they did find a substance called ethyl formate, the chemical responsible for the flavour of raspberries. "It does happen to give raspberries their flavour, but there are many other molecules that are needed to make space raspberries," Arnaud Belloche, an astronomer at the Max Planck Institute for Radio Astronomy in Bonn, told the Guardian. is the centre of the galaxy. Parody news site The Onion has a brief news article called Hillary Clinton Launches Intimidating New Fragrance Line, said fragrance being a perfume called Authorité, "described by its manufacturer as 'steely, bracing, and curt, with notes of patent leather, sandalwood, and wool serge'." 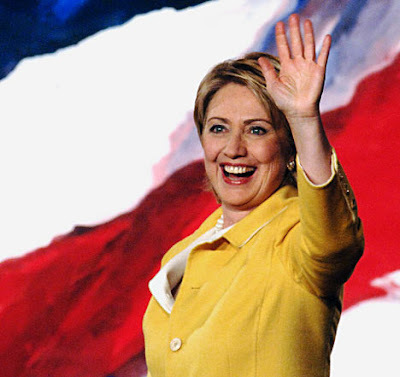 It's pointless to speculate what Hillary Clinton actually wears, but I'm going to do it anyway. I rather doubt she wears "a scent that brooks no argument", as the article suggests: she strikes me as a Diorissimo kind of woman, because a woman in politics is generally perceived as being loud, overbearing, and frankly masculine, so she might reasonably wear something fresh and pretty to disarm (or at least confuse) the men she comes into contact with. All those years in hot, humid Arkansas and Washington might well have gotten her into the habit of wearing lighter scents. Or hell, maybe she wears one of those gorgeous, colossal 1980s power chypres like Ungaro Diva or Paloma Picasso Mon Parfum. How would I know? I should probably just permanently disqualify myself from writing about anything that contains amber as a major component. Balmain's recent Ambre Gris does. The very top is sugared immortelle, not unlike L Lempicka, with a slightly fruity-floral feel to it, but lurking just below the surface--BANG, amber. A lot of amber. The trouble is that I love it. I have no sense of perspective on it at all. If I smell something heavily ambered, I'm probably going to just fall in love with the scent and then I'll lose all objectivity, although, come to think about it, I'm about as subjective as can be when it comes to scents: I love them or hate them and there isn't much middle ground. There isn't any with amber and ambergris, though. I am addicted to the stuff. Therefore, you are going to have to take everything I say with a grain of salt. If you don't like amber scents, or sweet scents, well, just move right along. The amber, as I have said, starts at the beginning and runs through the entire scent. It's not linear, though: grace notes and unexpected accords slide into view and then vanish, every one of them seemingly devised to act as counterpoint to the sweetness of the amber. A pointy little sprinkling of cinnamon appears about an hour in. Smack in the middle, for a little while, is tuberose: not enough to make it floral, and not enough to make me uncomfortable, but enough to cut through the gathering sweetness, a pinpoint spotlight piercing the fog. A slightly dusty wood and a crumb of myrrh show up late in the game. Finally, though, the amber swamps everything else, as it must: the base is amber and vanillic benzoin and not much else, for hours. 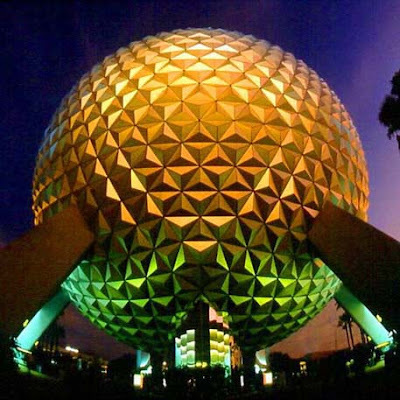 It is wonderfully composed and very beautiful. My first experience with an amber-dominated fragrance was in 1987 (I actually remember the year), when I bought a miniature of the 1985 scent Anne Klein II. Calvin Klein's Obsession, from the same year, also contained a lot of amber, but Anne Klein II was possessed by it: it was a strange little minimalist bottle (a glass cylinder cut in half down the long axis) full of pure liquid warmth. I had never smelled anything like it. I wore it all the time, down to the last drop. It was, of course, discontinued, although you can buy a duplicate of the scent, which is supposedly made with the original formula (the company that makes the copy has the right to use the recipe but not the name). Haven't tried it, don't know if it's exactly the same, but I had the experience of smelling it a couple of weeks ago nonetheless. In my last order from The Perfumed Court I had ordered the Ambergris Sampler, which contained Ambre Gris and six other scents. When I opened the little plastic enveloped to extract a sample, I of course stuck my nose in and took a whiff, and to my astonishment, that muddle of molecules from seven different fragrances smelled exactly like my memory of Anne Klein II. I did it again just now, and there it was again: the precise experience of smelling something I haven't smelled in twenty years. When I was going on last week about an online fragrance boutique called Parfum1, I had a reason for it. I had been browsing for the best price on a bottle of Ambre Gris, just in case, and Parfum1 has it for $22.50, with a 25% discount (code SPRING25NPE), making it a stunningly bargain-priced $16.25. For a 100-mL bottle. It'll last you forever, it's cheaper than any drugstore brand, and it's really nice. Several people have written in the comments that they've done business with the company and it's reputable, so what are you waiting for? This is good advice. Very good advice. I trusted that I would like anything of his and wouldn't be disappointed, but what if I had been? A waste of a bottle! As it turns out, I went with the one of his that I loved best, Lonestar Memories. It's glorious stuff, dark, resinous, smoky. If you haven't tried it, you really ought to. Mine arrived in the mail today, and I am going to be wearing this a lot. I should probably just permanently disqualify myself from writing about anything that contains iris as a major component. 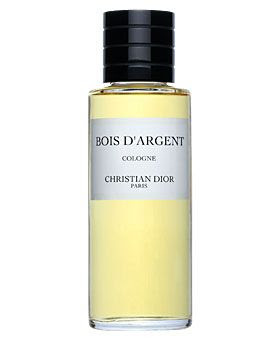 Dior's recent Bois D'Argent does. The very top is sugared incense, not unlike Demeter Incense, with a men's-cologne feel to it, but lurking just below the surface--BANG, iris and vanilla. A lot of iris. A lot of people, I feel compelled (as usual) to say, love this scent very much, and I suppose if you loved iris, you probably would, too. It's well-made, and the ingredients are certainly high-quality and probably expensive. But it is not for me. You don't have to believe that every single human characteristic, particularly those that seem to be part of a chasm between men and women, is explained by evolutionary biology to find this interesting: a theory as to why women on the whole seem to have a better sense of smell than men. It's because they're sniffing out the best possible mate. 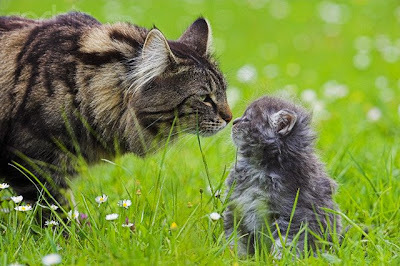 "Women have a larger interest in reproductive events because they have fewer opportunities for passing on their genes than men," said George Preti, a Monell Chemical Senses Center organic chemist...."Men produce thousands of gametes every day, women just one every month. Their investment in a reproductive event is higher than men's, so they're more biologically attuned to who they're mating with." Which, of course, makes perfect sense. Men--males, really--will famously mate with just about anyone (or anything), because that's a sensible reproductive strategy: broadcast your seed and hope one of them lands somewhere fertile. Females have a good reason to be a bit pickier: they have a much smaller number of reproductive opportunities, each of which takes much more out of them than it does out of the man, and what's more, before modern times, maternal mortality rates were something like 1 in 100, pretty bad odds, and even worse in the nineteenth century in the Western world, when men started to take over the practice of obstetrics from midwives and doctors were known to go from a dissection or an appendectomy to a delivery without washing their hands, which led to a horrifying forty per cent mortality rate. I have also read (and I don't have a source for it, and it may just be speculation and possibly even not true at all) that women have a more refined sense of smell and of taste, senses which are amplified during pregnancy, because the consequences for them are enormous if they should eat something which is dangerous for their health or that of the fetus: what an ordinarily healthy man might shrug off after a day or two of nausea and so forth might lead to disastrous miscarriage or birth defects for an otherwise healthy pregnant woman. I was doing the usual research and I came across an online fragrance retailer I didn't know anything about Parfum1.com. I've never ordered from them (obviously), but they have a great selection at good prices, and no, they are not paying me to say this. They're also having a promotion which gives you 25% off your order with the code SPRING25NPE, which means that you could get, say, a half-ounce of Caron's Bellodgia perfume for under $60 U.S., a 100-mL bottle of CSP's Vanille Abricot for about $26, 100 mL of Dalissime for $20, or 75 mL of Jacques Fath pour L'Homme for $18. If I had no self-control whatever I would be ordering a bunch of stuff from them (Kenzo Jungle Homme for $32! ), and in fact I just saw Floris go by in the list of houses and thought, "Uh-oh," and if they had had Malmaison for a good price I would send off an order, but fortunately, they don't, so I'm safe. For now. If you should place an order with them, or have ordered from them in the past, let me know how that worked out. The effect of Great Jones is marvellous: that of being flung bodily into a time machine and taken back, in a whirl of gears and sprockets, to the early 1970s, when male perfumery was a very different thing than it is now. 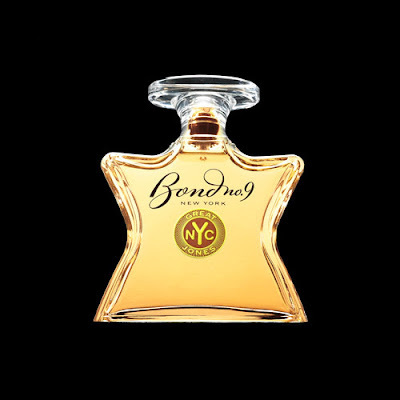 It calls to mind two of the mainstays of men's fragrance from that era: Pierre Cardin Pour Monsieur, launched in 1972, and Paco Rabanne Pour Homme, from 1973. There can't have been many dads or older brothers who didn't have a bottle of either or both in the medicine cabinet: Paco Rabanne, announcing its masculinity with a blocky, broad-shouldered swagger, or Pierre Cardin, the polar opposite in a curvaceous fistful of a bottle that can only be read as a phallus, both French and therefore exotic, both unquestionably masculine. They were the scent of a man who had graduated from Old Spice and Brut. 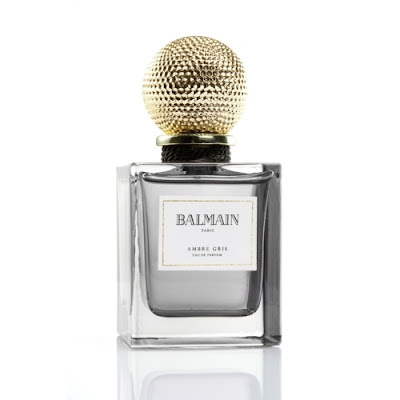 Before the Age of Calone, before everything had to be contaminated with freshness, or rather some manufacturers' idea of what freshness ought to be, Paco Rabanne and Pierre Cardin were what sophisticated maleness smelled like, and it smelled good. Great Jones is not a copy of either of these: it's more stripped down, in the modern manner. It's minimalist, focusing on a smaller number of ingredients rather than saturating the nose with a huge, complex harmony. But one of the time-travel surprises it holds is that it's a real, honest-to-goodness chypre in an age that doesn't see many of them, partly because they're no longer in fashion and partly because oakmoss is restricted in perfumery. But it's in here (either the real thing or a very good synthetic), and, as usual, it is glorious. At first is a great wallop of citrus notes, orange and bergamot, mostly, underscored with a dash of spice, a sheaf of greenery, and the first intimations of the mossy-woody chypre base. As the brightness begins to fade, the volume is turned up on the wood-and-vetiver centre. The wood is not particularly cedar-y; it doesn't have the sharpness or the slight smokiness I usually associate with cedar (and none of the pencil-sharpener quality). It's mostly just wood, to be honest, with a powderiness to it. The oakmoss is already moving in for the kill: though it's a rather refined sort of oakmoss, smoothed and rounded off (so unlike the vicious chypre of Mitsouko), it still has that languorous honeyed-earth smell that makes chypres so irresistible. Some commenters on other fragrance blogs have said that Great Jones is an exact duplicate of Paco Rabanne Pour Homme, and I unfortunately don't have a bottle of it so I can't say for sure. (It doesn't match my memory of it.) What I can say is that on its own, Great Jones is a knockout. In a sea of Identikit fragrances, it's something new: something old that smells as up to date as can be.